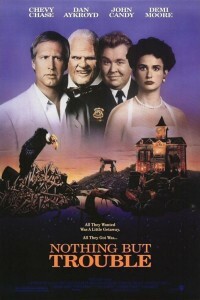 Last night, we watched Nothing But Trouble, a movie that I’d never heard of but Derrick remembered watching as a kid. In Dan Aykroyd’s directorial debut from 1991, Nothing But Trouble stars Chevy Chase, John Candy, Demi Moore, and (of course) Dan Aykroyd, so how could this movie do any wrong? The numbers give the majority’s opinion here. The movie, with an estimated $40 million dollar budget, was a mega-flop, with a gross of only $8 million. Here is the premise: When city slickers Chevy Chase, Demi Moore, and two friends decide to drive to Atlantic City, one of their pushy tagalongs, played by Taylor Negron (by the way, have you checked out this list??? ), insists on taking the scenic route. Chevy Chase accidentally rolls through a stop sign, and that is enough of a reason for law enforcement to arrest (or kidnap, really) the group and take them to see the Judge, who imprisons them in his strange home. As the out-of-towners try to escape, they realize that they are caught in a very very twisted web. Nothing But Trouble is my new favorite movie—seriously, it might even need to be purchased and added to our Halloween line-up this year. But I am the first to admit that this is a movie that didn’t know what it wanted to be. Is it comedy? Is it horror? I think it’s pretty obvious that Aykroyd was a fan of Texas Chainsaw Massacre 2, a legendary genre bender. For me, Chevy Chase and John Candy are enough to tip the scales over to comedy land, but there are some scenes—especially those with Demi Moore crying towards the end—which are pretty intense. This movie is lewd and crude in both its humor and murders. The chemistry between the actors is fantastic, and the delivery of lines always amuses and catches the viewer off guard. In one of my favorite moments, Chase and Moore are running down a hallway, checking doors to see if they can find an escape route. Chase opens one to see a room crammed to the brim with creepy broken baby doll heads. He says, “This must be the nursery,” and immediately continues down the hall without skipping a beat. Of course, it’s the nursery. Awesome.